November 18, 2017, Dunedin, FL — Steve Zumpano would never play for another manager, nor another team for that matter. 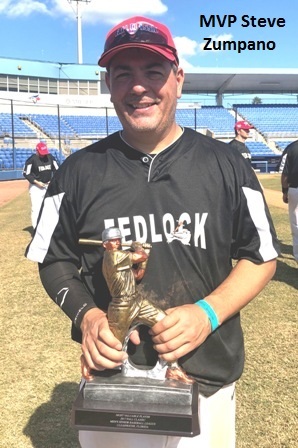 And that’s a good thing because Fedlock would hate to lose its MVP after Zumpano helped lead Fedlock to a 7-6 win in the 50 National Championship at Florida Auto Exchange Field on Nov. 18. 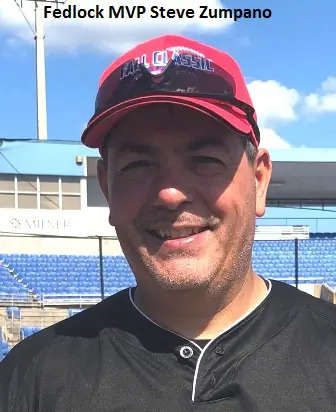 Jeff Himan hit a game-winning RBI single in the bottom of the eighth to break a 6-6 tie and secure Fedlock’s 10th overall title and first since 2013. Fedlock’s Ray Lloyd, who also had two RBI, came on in relief in the ninth to get the final two outs for the save. Reds starting pitcher Mike Mills went 2+ innings, giving up five runs. Dave Pannullo came in to relieve and threw 5+ innings while giving up only one run. “Give them a lot of credit, they are a solid team,” Fedlock manager Dave Cross said. “We made some base running mistakes, and they just took advantage of every mistake we made to stay in the game, but we got the clutch hit to win the game. This is the fourth title for Zumpano and he was glad Fedlock was able to return to the championship and overcome last year’s early exit.